Scientific evidence suggests that grooming a dog is a great way of reducing stress. And your puppy will benefit from it, too! A puppy’s first groom is a momentous occasion, similar to a human getting their first haircut and the initial approach can have a lifelong effect on a pup, positive or negative. Grooming isn’t just about making your puppy look good. Regular care removes dead hair, keeps the coat and skin healthy, and gives you the opportunity to check your pup’s general health. A pup’s initial experience can set the stage for how he responds to being groomed for the rest of his life so here are a few tips to benefit everyone. The preparation needs to start right from the first day the pup is home as puppies learn best aged between 7- 16 weeks. While the puppy is being conditioned to being touched and handled in a positive way you can start to introduce grooming equipment. To introduce each comb or brush, have some tasty small treats. Then show the brush to the pup and then feed a treat. Do this a few times, and then brush a few short strokes on the back and reward with a treat for good behaviour. Do the same process with combs and nail clippers. Show the item first, feed the treat, and then remove the item as you stop feeding. This sets up a positive association in the dog’s mind between a very nice thing (yummy treats) and the grooming equipment and process. Don’t wait too long for the first groom, the general rule of thumb is to start at around 16 weeks of age as they are usually easier to train. The first grooming sessions should be short and sweet. If you decide to send your pup to a professional groomer it is important that they go as soon as possible so they can get used to the person and the place. Most groomers are happy to have short initial sessions for puppies to get them used to grooming. 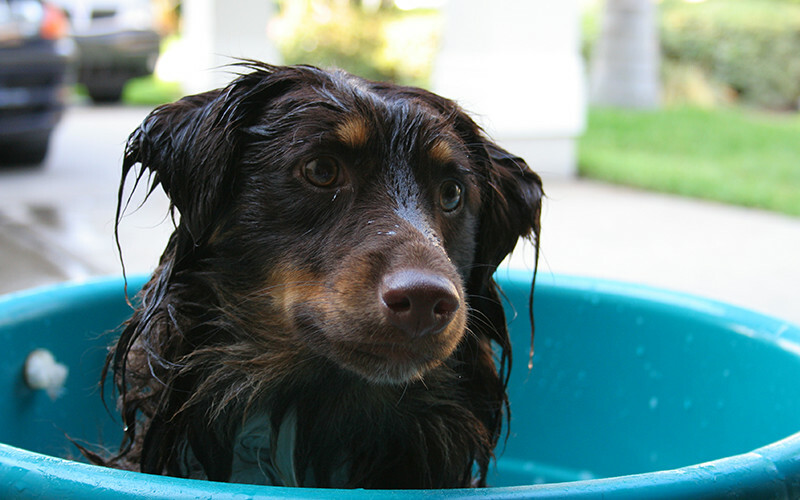 So how often should you bathe your new puppy? Well that depends a lot on your lifestyle, and your products. When used properly, most shampoos will give a good clean without stripping out the essential oils so anywhere from weekly to monthly is usually okay. One thing to remember is that the more you brush, the less you have to wash to keep your puppy smelling fresh and clean. To arrange a professional groomer for your puppy, call Jim’s Dog Wash on 131546 for a free quote.